These are some of the keys to the contemporary emergence of Les Montres DeWitt - in the space of barely four years - as a member of the exalted circle of innovative luxury watch manufacturers. They stem from the personality of Jérôme de Witt, whose personal history has inspired and condensed a body of values focused on a futuristic vision of horological micro-engineering. As much an aesthete as a designer, free of the constraints imposed by tradition or by any professional past as a watchmaker, Jérôme de Witt set up an extraordinary dynamic in an unprecedented space of time: a World First presented in Basel in 2003 with the Pressy Grande Complication, followed in 2005 by the launch of an original technological concept: the Academia Tourbillon Différentiel. 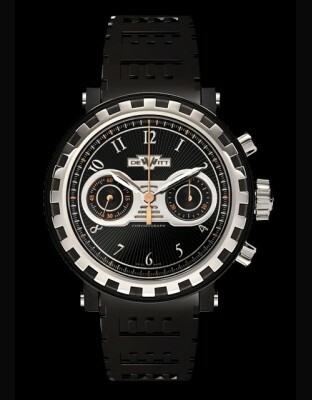 This model caused a sensation and won the Geneva Watchmaking Grand Prix in the Innovation category. The following year saw another innovative breakthrough in the form of new World First: the Tourbillon Academia Force Constante presented by Les Montres DeWitt at the International Watch Exhibition in Basel in 2006, setting the seal on a major innovation whose place is assured in the history of watch development. Both of these key innovations are patented. Two patents in five years, international recognition placing DeWitt in the ranks of the most avant-garde and elitist companies in terms of their conceptual and creative approach….. DeWitt has begun to redefine the concepts of Luxury Watchmaking to impose a new interpretation of genuine luxury.